I feel that Abe was the greatest dog produced in my breeding program. Abe had a bold, larger than life personality. Abe's conformation exhibited the classic broad Labrador head, otter tail, and nice length of leg. Abe's deep dark rich chocolate coat was exceptional. Abe was an International Show Champion, Master Hunter, and a third generation product of our breeding program. Abe was entered in three Canadian Shows in the Fall of 2007 and won a five point major. Abe was a hard charging retriever, a strong swimmer, an outgoing companion, and enjoyed being a spoiled house dog. Farewell my friend. 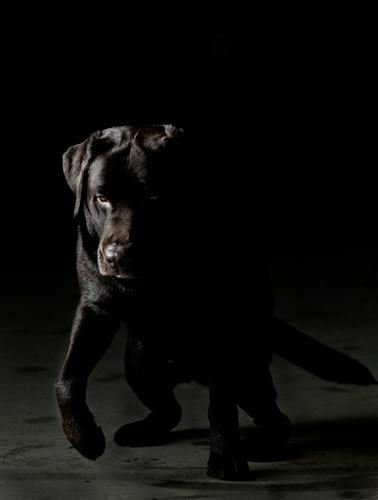 I am going to miss you so much…..
Abe's sire was the #8 ranked show Labrador in the USA in 1998. Abe's dam was a full-sister to Merganser's Radar O'Reilly MH, WC. Abe weighed 85# and stood 25 inches at the point of the shoulder. Abe's Penn Hip rating was within the top 10% for the Labrador breed. Penn Hip Distraction Index: In the 90th percentile for the Labrador breed.